Native to upland areas of Africa and Asia, voodoo lily has flowers that emit a foul smell resembling rotting meat. This odour attracts insect pollinators such as flies. Despite its putrid smell, voodoo lily is popularly cultivated as an ornamental. Its popularity is due in part to it being one of the easiest aroids to propagate and one of the hardest to kill. Tuber depressed globose, to ca. 9cm high and ca. 15cm in diam., producing numerous annual offsets, these globose or depressed globose. 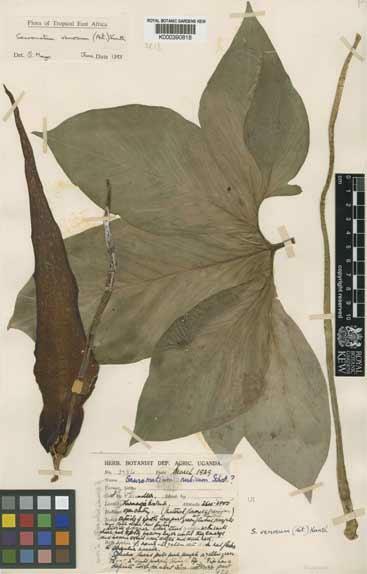 Petiole yellowish green, with rounded purplish brown spots, 20–100cm; leaf blade 9–11-pedatifid; central lobe oblong or oblong-elliptic to oblanceolate, 10–40 × 4–20cm, acuminate; lateral leaflets elliptic, gradually smaller toward distal end of rachis. Inflorescence appearing before leaves; peduncle greenish white, with or without a few brown spots, 3–7cm, sometimes elongating during fruiting. 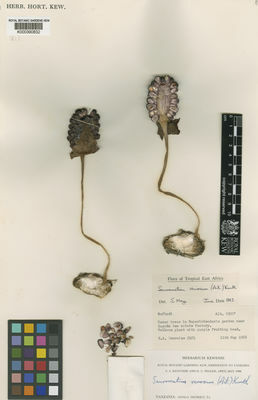 Spathe base outside dull dark violet, inside rich reddish purple, ellipsoid, 5–10 × 2–4cm; limb convolute at base, ca. 10cm, distally outside as base but slightly darker and with a few violet longitudinal stripes, inside background color yellowish, almost entirely covered by numerous orbicular to elliptic, confluent dark purple spots, lanceolate, 30–70 × 8–10cm, apex acuminate. Spadix slightly shorter than or as long as spathe; female zone subcylindric, 2–2.5 × 1–1.5cm; ovary violet or pale purple, obovoid, 2–4-ovuled; sterile zone 8–8.5cm, proximal 2–2.5cm sparsely covered with long staminodes, distally grooved and with a few distant conic projections, proximally whitish, distally pale brownish violet; staminodes yellow, clavate, 4–10mm; male zone 1–2 × 1–1.5cm; stamens yellow; appendix at first erect, finally recurved, pale brown to pale violet or lead-colored, terete, to30 cm, ca. 1cm in diam. at base, obtuse. Fruiting zone globose or subcylindric, naked, to ca. 9cm in diam. ; berries crowded, bright purple, cylindric, 5–10 × 2–4mm, angulate, apex truncate. Primary evergreen forests, meadows by rivers, secondary thickets, path sides. China [Xizang, Yunnan], Bhutan, NE and NW India, Myanmar, Nepal, Africa. Tuber depressed-globose, 4–10 cm. in diameter. 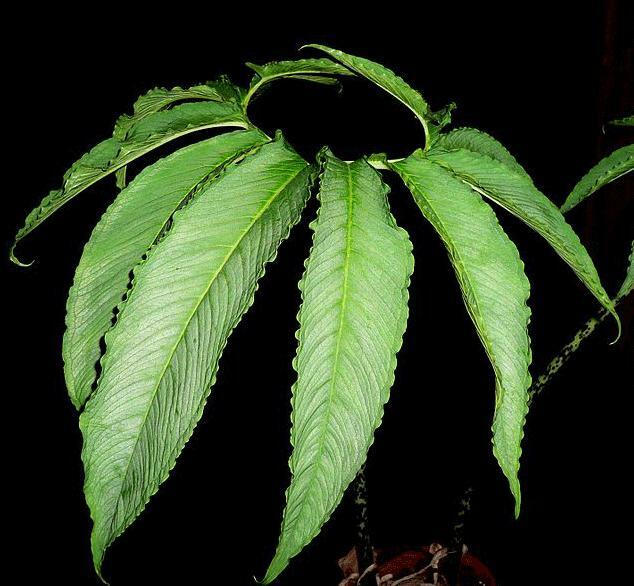 Petiole terete, up to 90 cm. long, green, often black-purple spotted or tinged brownish purple; blade kidney-shaped to subcircular in outline, 25–60 cm. broad, pedately-lobed; lobes 7–11, ovate-elliptic, acuminate, cuneate, deeply divided almost to base; central lobe usually obovate-elliptic, 12–30 cm. long, 5–16 cm. broad; lateral lobes progressively smaller. Inflorescence appearing before leaves, with very strong carrion smell at anthesis, subtended by several oblong-lanceolate cataphylls; peduncle short, 2–8 cm. 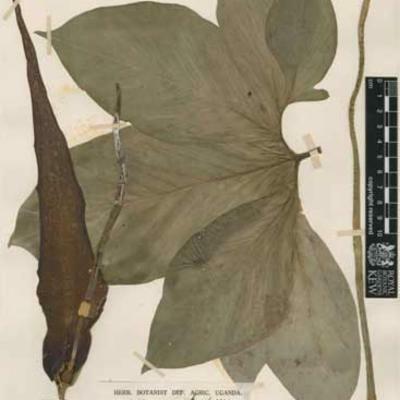 when in flower, subterranean, spathe borne at or partly below ground-level. Spathe 25–50 cm. long; tube subcylindric with inflated ellipsoid basal part, 5–10 cm. long, 2–5 cm. in diameter, erect, outside dull purplish green, inside reddish purple, smooth; limb narrowly lanceolate-triangular, 20–40 cm. long, 3–9 cm. broad, reflexing and twisting spirally at maturity, inner surface pale yellow to pale green with numerous dark maroon-purple oblong to subcircular spots that are smaller towards base and merge near crisped-undulate margins. Spadix 20–42 cm. long; sterile appendix cylindric, 14–30 cm. long, 0.5–1.6 cm. in diameter, erect at first, later curving forward, smooth, dull greyish green with cream base; staminate part cylindric, 1–1.7 cm. long, 0.5–1.5 cm. in diameter, sulphur yellow; sterile zone with cylindric, longitudinally ridged axis, 3.5–8 cm. long, 0.3–1.2 cm. in diameter, cream becoming purple apically, lowermost 1.5–2 cm. bearing 0.5–0.8 cm. long, horizontal to upward-curving, filiform to clavate, cream, sterile projections, with bluish-green, ± swollen tips; pistillate part cylindric to subconic, 0.7–1.6 cm. long, 0.6–1.4 cm. in diameter. Ovary flask-shaped to cylindric, dark reddish-purple; ovules 1–2, pear-shaped, borne on massive basal placental cushion; stigma capitate, cream, 0.5 mm. in diameter. Berries obovate, 0.9–1 cm. long, ± 0.8 cm. in diameter, 1–2-seeded, mulberry purple to red, borne at or partly below ground-level in tight subglobose head up to 4 cm. in diameter. Seed obovate, 0.7–0.8 cm. long, 0.45–0.55 cm. in diameter; testa fleshy, dark spotted; embryo small, central, cylindric; endosperm copious. In shade, damp woodlands, riverine forest, plantations and copses in upland grassland, damp upland cultivated land; 1000–2100 m.
Widely distributed from tropical Africa to China, voodoo lily is reported to occur in various habitats including evergreen forest, riverine forest and wet savannah, mostly in damp or wet areas in the shade. Overview: A tuberous perennial with a large, umbrella-like leaf on a brownish-red speckled petiole (leaf stalk) that appears after flowering. Flowers: The flowering parts consist of a spathe (hood-like structure) wrapped around a spadix (flower-bearing spike). The large, twisting spathe (up to 1 m long) is yellow to brown with reddish-purple spots. 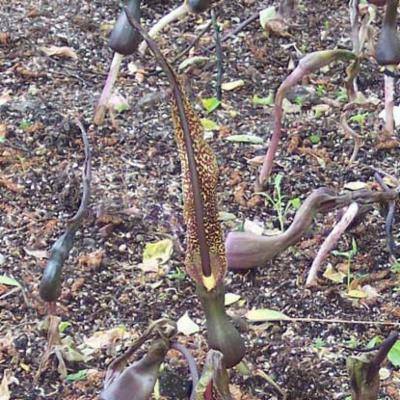 The purple spadix is slightly shorter or the same size as the spathe. Fruits: Red to bright purple berries. 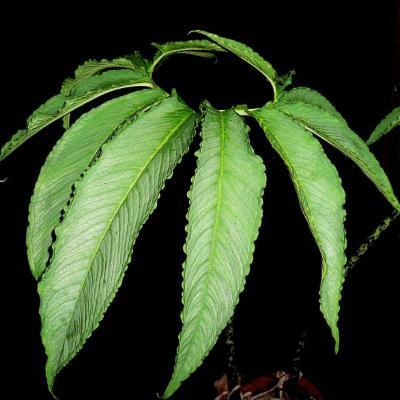 Sauromatum venosum is being monitored as part of the IUCN Sampled Red List Index for Plants, which aims to produce conservation assessments for a representative sample of the world's plant species. This information will then be used to monitor trends in extinction risk and help focus conservation efforts where they are needed most. Voodoo lily is cultivated as an ornamental. The tubers can be grown indoors as a curiosity; they can flower without soil or water, although the tuber should be planted and fed immediately after flowering if it is to be kept alive. The roasted tubers of Sauromatum venosum are eaten locally. 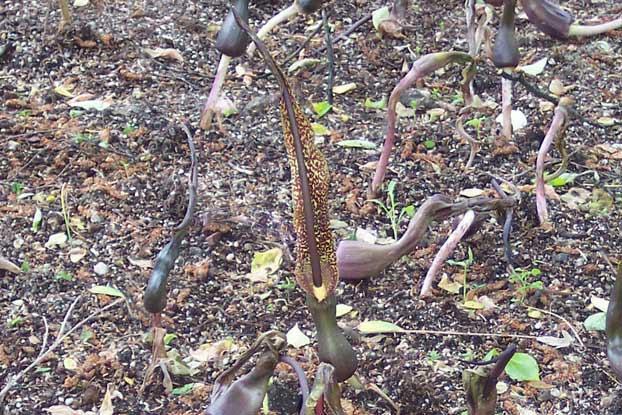 Sauromatum venosum is grown behind-the-scenes in Kew's Tropical Nursery. 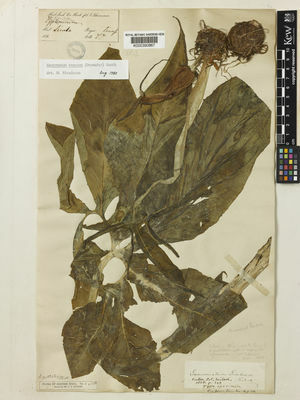 Dried and alcohol-preserved specimens of Sauromatum venosum are held in Kew's Herbarium, where they are available to researchers by appointment. 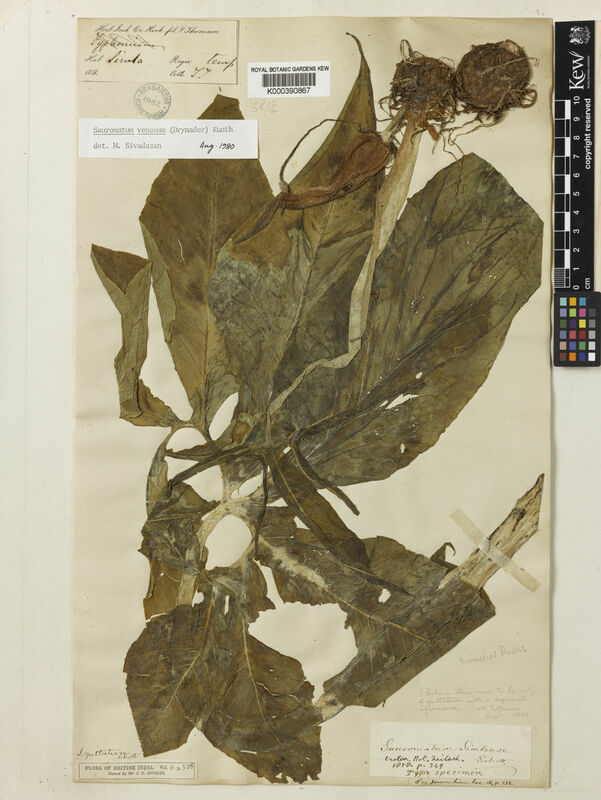 The details of some of these can be seen online in Kew's Herbarium Catalogue. Primary evergreen forests, meadows by rivers, secondary thickets and along the sides of paths. Least Concern (LC) according to IUCN Red List criteria. Intense irritation can be experienced when handling or consuming raw plant material of many members of Araceae (aroid plant family). In shady places in upland. Alocasia pedata (Link & Otto) Raf. Arum pedatum Fisch. ex Spreng. Desmesia venosum (Dryand. ex Aiton) Raf. Jaimenostia fernandopoana Guinea & Gómez Mor. Sauromatum guttatum var. pedatum (Link & Otto) Engl. Sauromatum guttatum var. pulchrum (Miq.) Engl. Sauromatum guttatum var. punctatum (K.Koch) Engl. Sauromatum guttatum var. sessiliflorum (Roxb.) Engl. Sauromatum guttatum var. simlense (Schott) Engl. Sauromatum guttatum var. venosum (Dryand. ex Aiton) Engl. World Checklist of Selected Plant Families (2010). 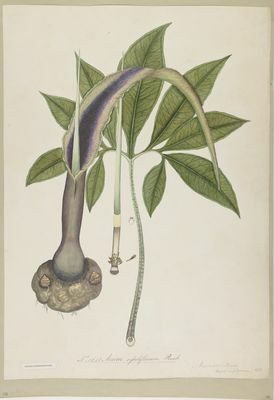 Sauromatum venosum. The Board of Trustees of the Royal Botanic Gardens, Kew. Thacker, H. (2009). Sauromatum venosum. Assessment using IUCN Categories and Criteria 3.1 (IUCN 2001). Royal Botanic Gardens, Kew. Huxley, A., Griffiths, M. & Levy, M. (eds) (1999). The New Royal Horticultural Society Dictionary of Gardening, Volume 4 (R to Z). Macmillan Reference, London. enum. Pl. 3: 28 (1841). A.D.Q. Agnew, Upland Kenya Wild Flowers p. 705, 706 (1974). Hepper in Flora of West Tropical Africa, ed. 2, 3: 116 (1968). Kunth, Enum. Pl. 3: 28 (1841).